From left, Wenona Kunesh, Isabelle McCurdy, Sophie McCurdy march July 20 with other anti-nuclear protesters in front of the TVA building in Chattanooga to demonstrate against the proposed development of nuclear plants. Zombie and other costumes will not be allowed at Thursday's TVA board meeting in Knoxville. The Tennessee Valley Authority has a message for opponents of it finishing a long-shuttered, 37-year-old nuclear plant in northeast Alabama: No costumes. A month after zombie-costumed protesters paraded in Chattanooga to oppose TVA reviving what they described as a "corpse of a power plant," the nation's largest public utility has posted a new ban on costumes at its board meeting Thursday. A TVA spokesman said the no-costume rule is intended to avoid any "disruption" at the meeting in Knoxville when the board acts on a recommendation to finish construction of a reactor at the Bellefonte Nuclear Plant where work was stopped and the site became a pricey scrap yard. An opponent of TVA's plan to restart the nuclear plant construction that was stopped in the 1980s said she and others want to see the project at least delayed. Sandy Kurtz and other members of the Bellefonte Efficiency and Sustainability Team group say promoting conservation and renewable energy sources are better alternatives. "We don't know where zombies will turn up," Kurtz said of the new costume rule. TVA executives are asking the board to approve building a projected $4 billion to $5 billion reactor, contending it will help keep rates low as TVA moves ahead with phasing out coal-fired power plants to reduce pollutants. That construction cost, on top of more than $4 billion already spent at the Bellefonte site on the Tennessee River, could be an obstacle. TVA, which is financially self-supporting, has a total debt of about $24 billion and a $30 billion debt ceiling. Changing the debt ceiling requires congressional approval. Otherwise, increased rates could be an option. Staff File Photo by Matt Fields-Johnson The two cooling towers at TVA's Bellefonte nuclear power plant in Hollywood, Ala., tower 500 feet above the ground. Project opponents also contend there are unanswered safety concerns about Bellefonte. They question the durability of the old structure, whether there is possible foundation damage from water intrusion and if there are possible weaknesses in the containment structure similar to those discovered at a nuclear plant in Florida. TVA executives say inspections have found no safety problems at the site. TVA President and CEO Tom Kilgore has said the staff is recommending that the board approve building a 1,260-megawatt, Babcock and Wilcox-designed reactor that is designed to power about 750,000 homes. TVA has six reactors at three sites along the Tennessee River in Tennessee and Alabama. 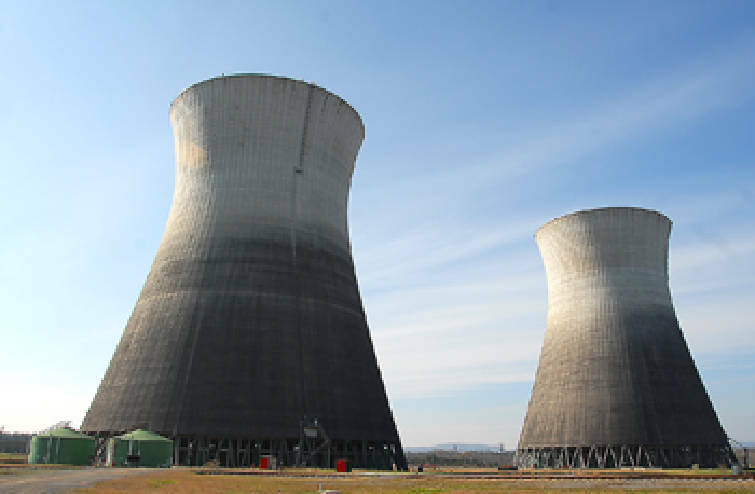 Kilgore and other TVA executives recently delayed the planned startup of a seventh reactor, Watts Bar Unit 2, for a year, and said it will be finished in 2013 before construction at Bellefonte starts. A project opponent, Southern Alliance for Clean Energy director Stephen Smith, wants TVA's board to delay its decision and further consider the safety and financial risks of finishing the old Bellefonte site. He said the decision to delay starting Bellefonte construction until at least 2013 further opens the door to such a delay. Fairewinds Associates Inc., chief engineer Arnold Gundersen, who prepared a report for the alliance on problems with TVA's' projected $4.7 billion reactor, has said the cost of the pressurized water reactor could more than double. TVA's top executives want to have it operating by 2018 but Smith said TVA's long-term plan includes no reason to "bring that reactor on at a date certain in the future." He said TVA can generate more power from natural gas and increase energy efficiency measures. Smith said it appears the board is facing political pressure "to either say go or no go." Tennessee Valley Authority President and CEO Tom Kilgore, left, talks before a tour of the Bellefonte Nuclear Plant in Hollywood, Ala., as Ray Hruby listens. The TVA staff plans to ask the TVA board of directors to approve the refurbishing and starting of the plant. The TVA board in June approved a long-range plan that calls for decreasing the utility's reliance on coal and increasing use of nuclear power, renewable energy, natural gas, hydroelectric and conservation. Kilgore has said building the Bellefonte reactor is the right move for the utility's 9 million rate payers in Tennessee, Kentucky, Virginia, Alabama, Georgia, North Carolina and Mississippi and for the environment. The Bellefonte plant - with yet-to-be-replaced equipment showing old age and inside walls with peeling paint - has two cooling towers and decades ago was among the utility's plans to build 17 reactors at seven sites. Most of those plans were dropped because of cost and a lack of demand for electrical power. After construction at Bellefonte was stopped in 1988, much of the equipment was removed. In 2009, the Nuclear Regulatory Commission approved TVA's request to reinstate Bellefonte's original construction permits. Kilgore in April delayed seeking board approval to restart construction at Bellefonte, with Kilgore saying the utility was continuing to monitor the March crisis in Japan. Kilgore has since told reporters that TVA has closely monitored the nuclear emergency in Japan but is moving ahead, confident that nuclear power is safe and "cleaner than any other realistic alternative." He said the Bellefonte design would weather 200 mph winds and an 8.9 magnitude earthquake. TVA executives have said the utility's review of its nuclear plants since the March nuclear disaster in Japan has led to immediately adding gasoline-powered generators, diesel-powered fire pumps and satellite telephones for emergency responders to use. Longer term responses include moving additional spent fuel from pools to dry cask storage and adding diesel generators. The NRC has recommended that all nuclear plants re-evaluate their earthquake and flood risk, add equipment to deal with simultaneous damage to multiple reactors and make sure electrical power and instruments are in place to monitor and cool spent fuel pools after a disaster. An NRC task force said there is no imminent risk from nuclear power plants in the United States. NRC spokesman Roger Hannah said TVA is not alone among electrical utilities in the region that are moving ahead with nuclear projects since the Fukushima Dai-ichi accident in Japan. Georgia Power is preparing to build two new reactors at Plant Vogtle near Augusta, Ga., and South Carolina Electric & Gas Co. has said it expects to have a federal license by January to operate two new nuclear reactors it wants to build in Fairfield County. "At this point there do not appear to be any applicants for combined operating licenses that have changed their current schedules," Hannah said.